Alright, you might be wondering why the heck I was in Richmond of all places. Yes, I have a hate-hate relationship with this place; but one cannot deny the gastronomical delights that lay within its borders. It's almost like I have to come here despite the traffic, clueless drivers and utter chaos (otherwise known as #3 Road). Now, you'll be even more surprised that I didn't come here for the Chinese food today. I was here to eat Indian food. Wait, lemme get this straight... You came all the way to Richmond for Indian food??? 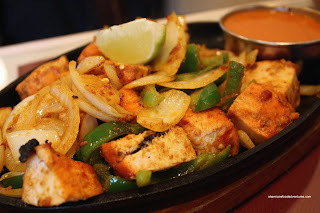 Don't you have really good Indian food in the Surrey/North Delta area? Yes, that is right. It's alm ost as crazy as trying to find good Chinese food out in Chilliwack. 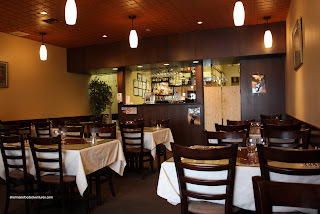 However, there is this place right next to Continental Restaurant that succeeds in a sea of Chinese establishments. 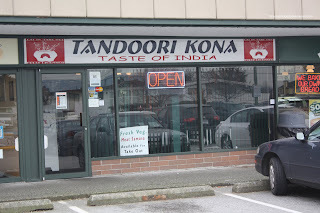 Actually, I was tipped off nearly a year ago in my Mirch Masala post about Tandoori Kona. Yah, it has taken me this long to finally fulfill my promise to try it. Hey, there are a lot of restaurants in different places! Everything in due time... The first thing that I noticed when I walked in the door was the daily special. For only $7.99, you could get Butter Chicken, Eggplant & Potato Curry and Chickpea Curry with Rice, Naan, Salad and Raita. That sounded too good for me to pass up. However, being a bit curious about the "tandoori" part of the name, I wanted to try it. I wasn't in the mood for Tandoori Chicken since the bones would just slow down my eating. I went for the next best thing in an order of Chicken Tikka which is essentially boneless tandoori chicken on a hot plate. I know it's not exactly the same; but close enough for my purposes. One look at the lunch special and some people might be wondering where the food is. Not to worry, once you're done with the rice and naan, you'll be plenty full. There is no need for too much sauce, it goes a long way. Much like pasta, it's mostly noodles with just a bit of sauce. Despite being a bit lukewarm, I did like the Butter Chicken, it was creamy and had a nice balance between sweet and tart without being salty. The modest amount of chicken was moist and tender. 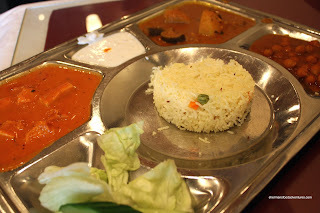 Both the eggplant and chickpea curries were quite mild and didn't really leave an impression. I really liked the naan. 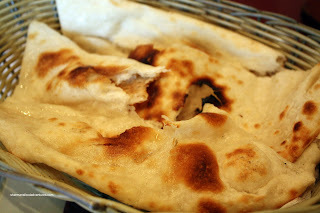 Soft, warm and just a bit blistered, this is the texture I look for when it comes to naan. When it came to the Chicken Tikka, it looked strange. Now for people who have had this dish before, as you can see, it doesn't resemble it whatsoever. Rather, I think I got an order of Chicken Tikka Masala since it was served with a side of spicy butter chicken sauce. I didn't have time to send it back, so I ended up eating it. It was quite good, with big chunks of tender white meat. However, I would've preferred that they had actually prepared the chicken with some charring. But I guess they don't prepare it that way here. Dipped into the sauce, I ended up with a spicier, more flavourful version of the butter chicken that I had in the special. Overall, I thought the food was pretty decent, especially for being in Richmond. Prices are very reasonable and service is friendly in a clean environment. There is also a (used to be?) good sushi restaurant in the same complex behind the DQ: Kiyo Sushi. However, it is a pain to get there due to space. Worked in Richmond? Poor you! LOL. Yah, the plate was sorta cold and prison-like. But did the job I suppose. Sushi? I guess I'll try it next if and when I'm in Richmond again. What's with all the hate on Richmond? It's a beautiful city that I've lived in my whole life, there's so much great food and entertainment here I rarely find myself with need to leave the city. I don't see what's wrong with 3 Road either, it's like any typical main street; stay clear during rush hour. Well, if you read my blog, it is tongue-in-cheek. But if you take it seriously, you must know that I always mention that Richmond has so much to offer, especially food! Oh, and yah, the traffic in Richmond is quite challenging sometimes. I've lived in Vancouver all my life too and am a regular visitor to Richmond. I only state what I experience. With that being said, I really don't have anything against Richmond. You just need to read between the lines... :) Furthermore, check out Urbanspoon, you'll see Richmond is my second most visited dining destination!